We’re living in a microwave kind of world. We’ve grown accustomed to having our food prepared fast, downloading content from the Internet in a blink and even taking care of most of our banking without ever standing in line again. When it comes to getting rid of your junk, you shouldn’t have to wait long for that either and you won’t as long as you hire Junk King Atlanta South. Junk King Atlanta South is part of a national chain of professional junk haulers with a simple philosophy: They do all the work. First, you have to decide what you want to get rid of. With Junk King, there are few limitations. It doesn’t matter how heavy something might be or where it currently resides in your house. If you want it gone, then you just tell the crew from Junk King. That crew will consist of at least two capable movers. These workers have all been licensed, bonded and insured. That sets them apart from many other so-called professionals. It also makes them completely trustworthy. 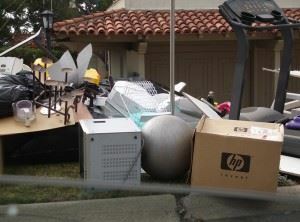 When the Junk King crew shows up at your home, you’ll show them all the things you want removed. Remember, you’re not going to be lifting anything. Once they’ve sized it all up, they’ll present you with a written estimate for the work. That estimate will be based on volume. It all comes down to how much space your junk is going to fill on the back of the truck. You won’t be charged by the pound with Junk King. That will make a huge difference to your bottom line if you want to get rid of things like roofing materials or other construction waste. Yes, Junk King will also gladly clear out all your yard waste including stones, pavers, bricks and concrete. Once you agree on the price, it will be locked down. Even if your junk ends up using more space on the truck, you’ll still only pay that original estimate. After everything is loaded onto the truck, the crew will head off to their next appointment and you can get back to your day. You could even benefit from a same-day junk removal session. Are you ready to get rid of all your junk in a single junk hauling appointment? Then Junk King Atlanta South is the call to make. This entry was posted in Atlanta South Junk Hauling and tagged junk hauling, junk king, junk removal on March 25, 2016 by Mikhail Munenzon. Last updated August 2, 2017 .